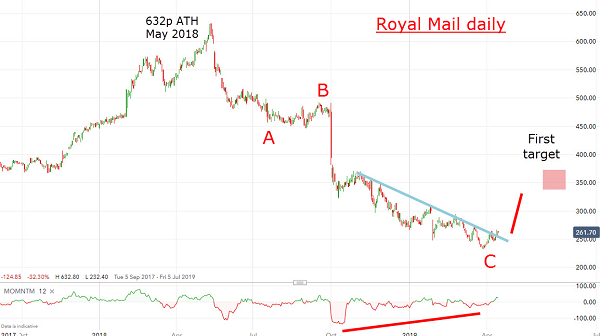 Does Royal Mail (LSE:RMG) have any friends at all at the moment? The stock has been beaten down to the recent 234p low from an all-time high of 632p last May. What a stunning collapse! Some may wonder if its mail delivery service is passing into oblivion with the multitude of hungry competitors out there. But it certainly has staying power on its side, having started life in 1516 in the reign of Mary Tudor! 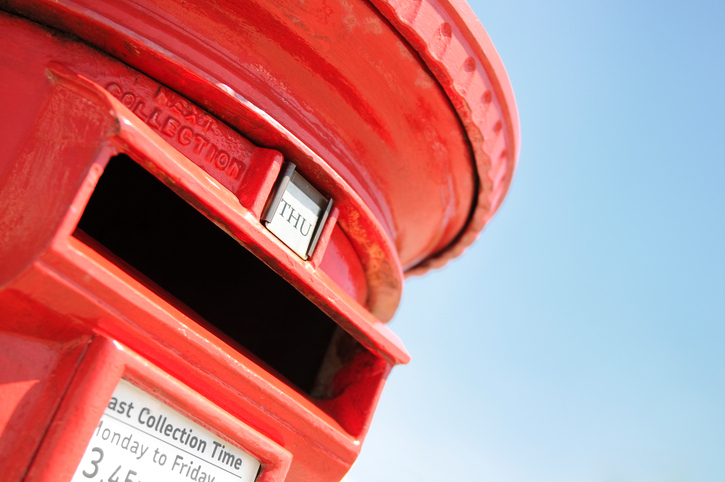 Perhaps a major low in public approval came in February when it was forced to apologise following a hike in the price of first and second class stamps by 3p to 70p and 61p respectively. The increase broke Ofcom's price cap on second class stamps of 60p, which had been in place until April 1. Today I want to examine the case for putting it into my Buy Low/Sell High list. It shows the steep slide off the May high and appears to be in three major waves. If so, I expect a reversal up at some point since a three wave pattern is counter-trend. But is the timing right for such a reversal now? The last part of the decline from October is a pattern that contains overlapping waves giving the impression that the market is only grudgingly giving up ground to the bears. And the huge momentum divergence shows considerable accumulation is taking place. This has all the hallmarks of an impending upside reversal and last week, my minor blue trendline was on the verge of being penetrated. It is a universal feature of bombed-out shares that there appears few obvious reasons to be bullish - and plenty to be bearish. Of course, some situations have little hope and these go bust. This is an almost unthinkable option for the Royal Mail. Yes, it has many problems — the poor productivity and the ongoing pay/pensions battle being two major issues. Also, the dividend was cut recently. Not a pretty picture - and that is why the share price is low. But the technical picture I have drawn tells me that while it may not reach its all time high at any time soon, it does have major upside potential with low downside risk. My first target is at the 350p - 370p region. After that, there will almost certainly be some bullish developments that are invisible today (such as a credible restructuring plan to be announced in May, perhaps?). For what it is worth, the CEO is buying, so it has at least one friend.